There he is, in the background of paintings, schoolbook illustrations, celebratory films. He's hauling a boat, cradling a rifle, looking on. He is often bare-chested. No one is speaking to him. Frankly, his presence is a little embarrassing. He is York, William Clark's body servant—slavery's version of a valet. It is not clear why Clark brought him along, although York would have had a good deal of experience caring for the sickly Clark. The co-leader's journal entries afford only the briefest glimpses of a man whose name he often didn't capitalize. We hear of York at work, sawing wood for huts or gathering cress for his master's dinner. There's steamed York: "my Servent nearly exosted with heat thurst and fatigue." And frozen York: "my Servents feet also frosted & his P—s a little." An overworked York: "my boy york verry unwell from violent Colds & Strains Carrying in meet and lifting logs on the huts to build them." And a York, uneasily at play: "York verry near loseing his Eyes by one of the men throwing Sand at him in fun." 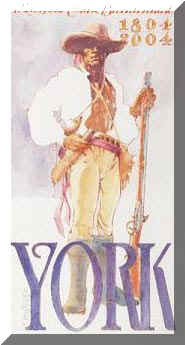 Although Clark took York for granted, the Native Americans were intrigued by him. 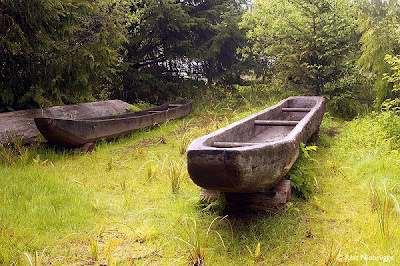 The Arikara Indians were "much asstonished at my Black Servent and Call him the big medison." This could create problems in Clark's eyes: "my black Servent ... made him Self more turrible in thier view than I wished him to Doe ... telling them that before I cought him he was wild & lived upon people." Yet Clark could play the York card when it served his purpose: "I ordered my black Servent to Dance which amused the Croud verry much." There are hints that York's status improved during the expedition. Later journal entries mention him scouting and being sent to villages to trade. Clark names geography for him: York's Eight Islands; York's Dry Creek. 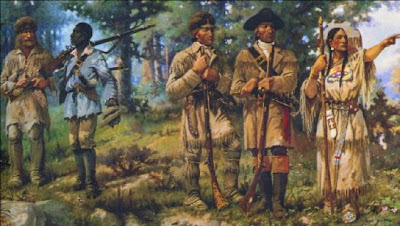 When the captains poll the crew about where to spend the winter of 1805-06, York's opinion is recorded—last, with Sacagawea's. So perhaps he had earned a little respect. 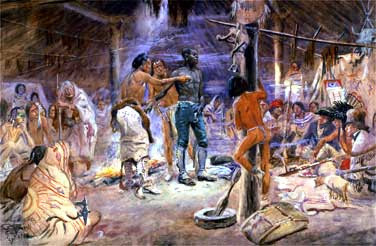 Meeting with Cameahwait Indians as they touch William Clark's slave York. Clark (the red-haired one) is behind him; and Sacagawea is behind Clark with her baby. 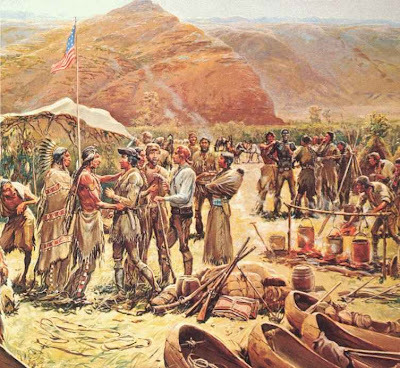 After the corps returned, all the men received double pay and land grants from a grateful Congress—except, of course, York. He apparently thought that in lieu of all that, his pay might be ... his freedom? Clark, who had settled in St. Louis, reacted badly. He allowed York to return temporarily to Louisville to rejoin his wife, who had a different master. But Clark wrote to his brother Jonathan, "if any attempt is made by york to run off, or refuse to provorm his duty as a Slave, I wish him Sent to New Orleans and Sold, or hired out to Some Severe master untill he thinks better of Such Conduct." Outraged bewilderment rings from this and other letters included in the new book Dear Brother: Letters of William Clark to Jonathan Clark. Clark had known York since they were boys; in some ways, he'd been more intimate with York than with any other human being. Clark's callousness toward York sits awkwardly with his portrayal as an American hero. 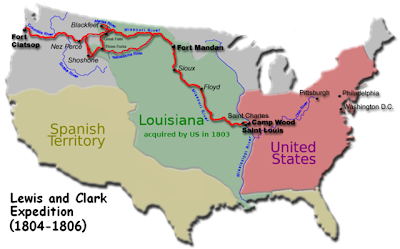 That might be one reason why the new IMAXNational Geographic film on Lewis and Clark neglects it, saying only that Clark eventually freed York. Well, maybe. That is what Clark told Washington Irving in 1832, making certain his famous literary visitor knew that York's life as a freeman had been a failure. "'Damn this freedom,' said York," according to Irving's notes, "'I have never had a happy day since I got it.' He determined to go back to his old master—set off for St. Louis but was taken with the choke in Tennessee & died." Yet two months after this conversation, a fur trader named Zenas Leonard encountered a black man living among a band of Crow Indians. The man claimed to be York. Could he instead have run off, as Clark had feared? Perhaps it's comforting to think that Clark freed York. But if it's comfort we're after, then between Clark's story of the demoralized ex-slave dying on his way back to beg his master's forgiveness and Leonard's story, I know which I prefer. Of the black man he met among the Crow, Leonard wrote, "He enjoys perfect peace and satisfaction, and has everything that he desires at his own command." 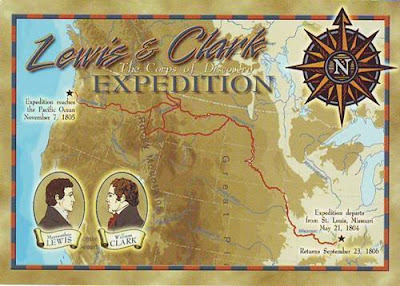 Brian Hall's novel about Lewis and Clark, "I Should Be Extremely Happy in Your Company," published by Viking .